The Beam n Read Hands-Free Light is a true "Reading Light" that makes it easy to read anything including printed books, eReaders, newspapers, letters from mom, instruction sheets in an emergency kit, the label on a bottle, and even a flimsy medication instruction sheet. It's the only personal light with snap-on blue light blocking filters so the light won't stimulate you when you're reading to relax for sleep. Beam n Read's wide light easily covers 2 hardcover or paperback book pages. Contrast this with a typical clip-on book light that illuminates only one page at a time. And, with paperbacks clip-ons may need to be unclipped and shifted when turning pages. Few of these "attachable" lights work with newspapers, magazines or other soft materials. Worn around the neck, a Beam n Read works well for choir members reading music, for writing in journals, diaries, or even making plans on napkins or the backs of envelopes in a dimly lit restaurant. Did you know that white LEDs shine a lot of blue light - and that blue light delays sleep? Beam n Read is the only reading light that offers snap-on filters to block the blue component of light when reading in bed at night. The Orange Relaxation Filter softens the light, shifting the cool daylight-type LED light to a warm incandescent-type light by blocking blue light. The Red Relaxation Filter blocks blue and green light. Filters vary by model. See Blocking Blue Light for Sleep for more details. The extra long battery runtime keeps the Beam n Read shining long after others personal lights have gone dim. The 3 LED Beam n Read Light is brighter than a leading brand's 6 LED clip-on booklight with batteries lasting ten times longer. 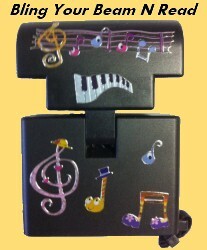 Want to save batteries for power outages or when portability is needed? With the optional Beam n Read USB Power Kit you can plug into a USB socket for external power. Use the included USB/AC Adapter or plug into a USB car adapter, or the USB socket at your plane seat or in your hotel room, etc. 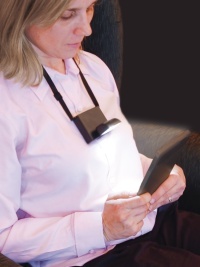 The Beam n Read LED 3 Hands-Free Travel & Reading Light (model BNR LED 3F) is great for reading. It has 3 LEDs in a row delivering a wide light that illuminates both pages of a hardcover book. The light is brighter than clip-ons with 6 LEDs and the extra long battery runtime makes it more economical than other lights. 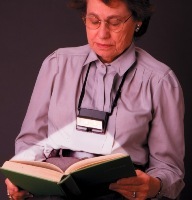 The Beam n Read LED 6 Hands-Free Task Light (model BNR LED 6-3F) delivers an even brighter and wider light which can be helpful for those with vision difficulties or who also use the light for tasks like needlework. Beam n Read Lights are very versatile and can be used anywhere for a wide range of other uses including: Every Day Tasks, Needlework & Crafts, Travel & Camping, during Power Outages, for Caregiving to children or adults, and for Seniors & Special Needs. Beam N Read - It's a life-changer!